It’s not Gothmas without a gothic christmas tree, so I’ve collected the best ornaments to create a tree worthy of Baphomet. I really love that even within “goth” you can have a range of different styles and so I’ve tried to represent them here. From serial killers to skulls to Disney, I hope you find something that satisfies your little darkling heart. For those of us with a penchant for murders and executions, Pandora’s Box is offering the perfect christmas tree decorations. Printed with the faces of your favourite serial killers, you can choose the colours to match the rest of your decor. Truly ones for scaring your grandma! If you’d rather avoid controversy and would rather go for straight up offence, there’s a sweary bauble just for you too. Shop all of the baubles here. Going in the complete opposite direction, we have Disney (I feel like I should apologise to both parties because they don’t really go together…). Of course, this is about Jack Skellington and all the Disney villains. Head to the Disney Christmas shop here. These handmade tree decorations are super cute. The lumps of coals with little eyes, the bats and the heart-shaped “Merry Gothmas” ornaments are perfect for gothing up your tree. The set is such great value for money and it comes in a super cool box. What more could you want? Laser cut acrylic, this design features twelve interlocking skull and cross bones. It can be made in a range of different colours, but the black glitter version catches the light and sparkles beautifully. Perfect for an alternative tree! 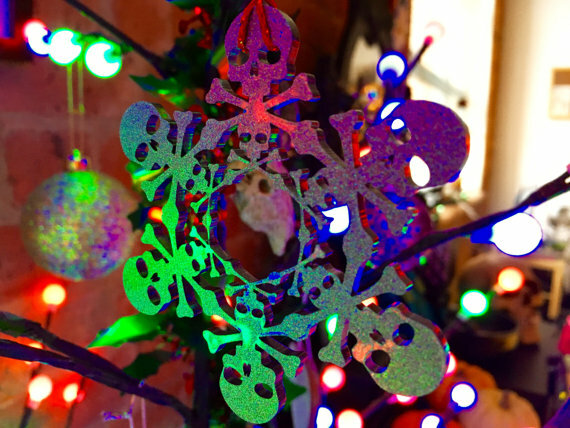 Browse all of Skully Bunting’s Christmas offering here. For a more traditionally gothic christmas tree, these baubles are perfect. The black and gold keep it classy but the upside down cross detail and jewel drops give them a beautifully gothic edge. If it’s something more decorative you’re after, SensSkulls have everything you need. With Day of the Dead sugar skulls encrusted with glitter, available in a variety of different colours, you can really decorate whatever your colour scheme! Shop all of the collection here. If you prefer anatomy over sugar skulls, ToothxNail have some beautifully illustrated designs for you. They usually do patches, but they’ve turned their hand to tree ornaments too! These skulls are resin cast and beautifully sculpted, down to skull plate joins. 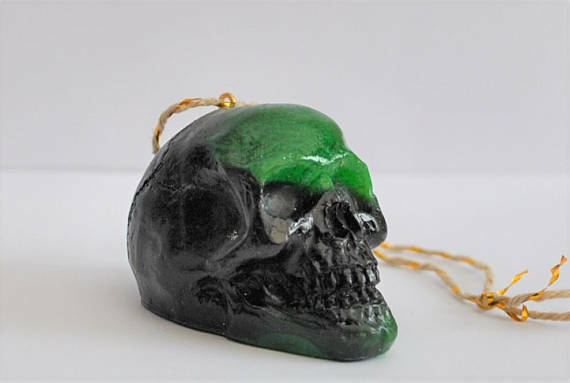 While some are just one colour, some of the ornaments have different colours swirled around in the mould so you’ve got something extra creepy-looking to weird up your tree. Take a look at the shop here. Have you taken a look at my other Gothmas posts? Check out Christmas Jumpers to Scare your Grandma and Creepy Christmas Cards.